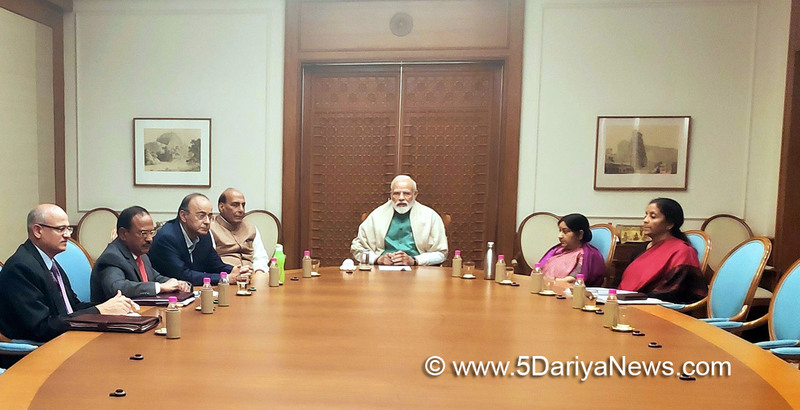 Prime Minister Narendra Modi on Sunday chaired a meeting of the National Security Council.Defence Minister Nirmala Sitharaman, Finance Minister Arun Jaitley, External Affairs Minister Sushma Swaraj, Home Minister Rajnath Singh, National Security Advisor Ajit Doval and Foreign Secretary Vijay Gokhale attended the meeting.The meeting comes amid a report that Jaish-e-Mohammad (JeM) chief Masood Azhar getting killed in the bombardment by Indian Air Force (IAF) on a terror camp in Balakot going viral, but there was no confirmation from any authoritative sources.It also comes after two militants, five security men and a civilian were killed in the 48-hour-long gunfight that ended on Sunday in Jammu and Kashmir's border Kupwara district.After the IAF carried out air strikes at a massive JeM camp in Balakot in Pakistan's Khyber-Pakhtunkhwa province early on Tuesday, the tension between the two countries escalated.The air strike came 12 days after a CRPF convoy was attacked by a suicide bomber in Jammu and Kashmir's Pulwama, in which 40 security personnel were killed. Pakistan-based JeM claimed responsibility for the attack.In response, Pakistani aircraft crossed the Line of Control on Wednesday in an attempt to target India's military installations. While an India MiG-21 was shot down and its pilot, Wing Commander Abhinandan Varthaman, captured when he landed in Pakistan-administered Kashmir, a Pakistan Air Force F-16 was also shot down.The IAF officer returned to India on Friday, a day after Pakistan Prime Minister Imran Khan announced his release as a "gesture of peace".